Ylang-Ylang (Cananga odorata) a.k.a Perfume Tree. 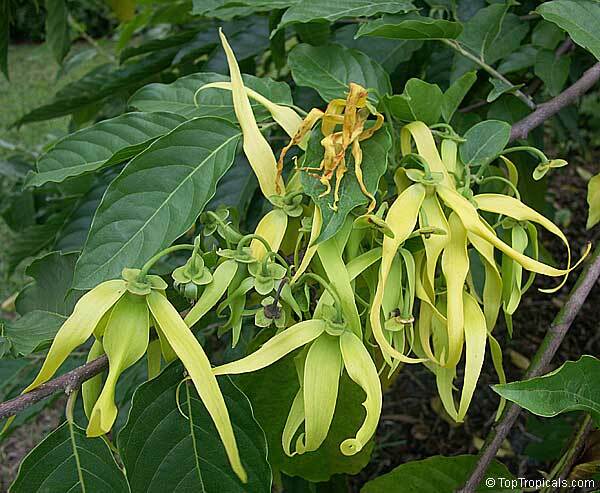 Originating in the Philippines, ylang ylang means “flower of flowers” or “fragrance of all fragrances.” This fragrance is traditionally used in aromatherapy to sharpen the senses and to temper depression, fear, anger, and jealousy. For these reasons, and also because of its reputation as an aphrodisiac, the flowers are spread on the beds of the newly married in Indonesia. Modern aromatherapists find the scent strongly sedating, easily sending the most reluctant sleeper off to dreamland. 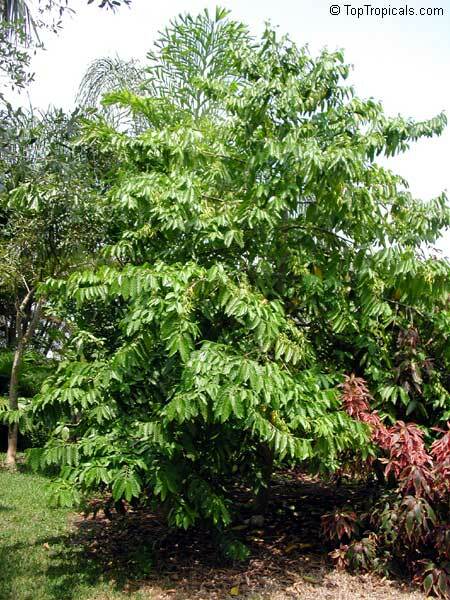 Science, on the other hand, regards ylang ylang essential oil more as a mental stimulant. Can it be both? Quite possibly it stimulates people’ s minds in one way while relaxing them in another. Ylang ylang is also widely used as a cosmetic when mixed with coconut oil. People throughout the tropics use it to protect their hair from salt water damage. Today, as one of the most abundant and least expensive of the true floral-smelling essential oils, it is a favorite in perfumes and cosmetics and is even added to some beverages and desserts. The essential oil varies greatly due to climatic and botanical differences. As a result, there are several commercial grades with distinct scents. 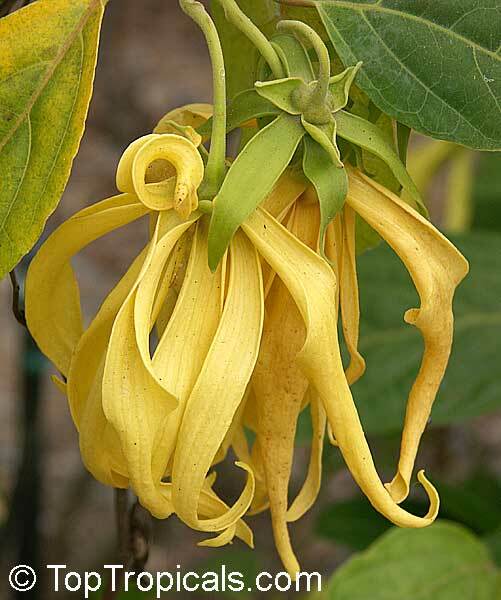 Therapeutic properties of ylang ylang: Antidepressant; stimulates circulation, relieves muscle spasms, lowers blood pressure, relaxes nerves. Uses for ylang ylang: Of all the essential oils, ylang ylang is one of the best at relaxing the mind and the body. Simply sniffing it can slightly lower blood pressure, although taking a bath with the oil or using it in a massage oil greatly enhances the relaxation experience. It can be helpful in cases of stress, shock, or anxiety. 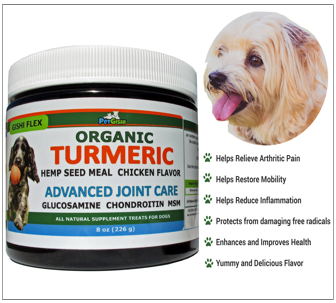 When used as a hair tonic, it balances oil production. Add about 6 drops to every ounce of hair conditioner. Note that when one buys Ylang-Ylang oil on the Internet, he or she has to pay 10 to 20 times as much as it costs in the Philippines. That's enough profit to think about growing one's own groves of Ylang-Ylang. well, what I like most of your personal info is that you say you are married to the most charming man...I hope this will never change in your life.